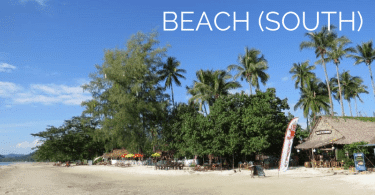 There isn’t much in the way of mid price accommodation on Klong Prao beach and so for anyone looking for a comfortable bungalow the longstanding Blue Lagoon Bungalows is a good option. It is located at the southern end of the beach, on a small river estuary, about 100 metres from the beach. Blue Lagoon has 20 rooms, some by the riverside and others set back in the garden area. If you are looking for a laid back place just a few minutes walk from the local village then this is an ideal spot. Each bungalow has a bathroom, a refrigerator, and either air conditioning or a fan. The rooms have either a double bed or twin beds plus mosquito nets. All are also equipped with a hammock and a table, chairs or chaise lounges on the balcony area. Blue Lagoon prides itself on it’s eco-friendly credentials. They grow a lot of herbs and vegetables on site plus have a mushroom hut. There’s also a herbal sauna if you feel the need to sweat even more than you would normally. There is also a riverfront bar & restaurant and one of the island’s longest established Thai cooking schools is based at the resort. The cooking school is run by ‘Ya’ the owner of the resort. i have a question, i probably know the answer..
but i’ll ask anyway.. is there a room available from 30-12 until 11-01? i saw the resort on the internet and fell in love with it..
Hi Tasja. Youll have to book placeson a cooking course when you are on Koh Chang. Do this at any tour agent near your hotel. Is it possible to go to a cooking class the 31 of december or the 1.th of january for me and my two children at 12 and 15? I think you’ll have to contact Blue Lagoon direct. i don;t know if they have availability.